If a question A is a duplicate of a combination of two questions, what should I do? Should I flag it as duplicate of one of the two questions, and leave a comment? The issue I have with comments is that that aren't meant to be kept forever: they may be deleted anytime, and users don't have access to their deleted comments. Even the source of non-deleted comments cannot be obtained. Example 1: Neural networks: Differences between standard backpropagation, momentum and weight decay is a duplicate of the combination of Difference between neural net weight decay and learning rate and What is the intuition of momentum term in the neural network back propagation?. Example 2: fine-tuned end-to-end meaning = Fine Tuning vs Joint Training vs Feature Extraction + What does end to end mean in deep learning methods? 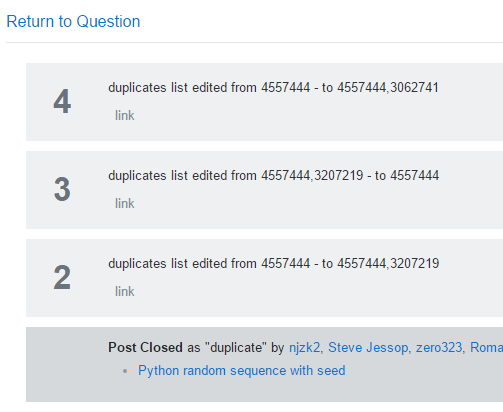 A question can be closed as a duplicate of two others if different users voting to close pick different duplicates (a recent example), but a single user can't pick more than one. Leaving a comment linking to a second duplicate is good enough—it could be deleted, but won't be. Links to both will appear 'Linked' list on the right of the page. In some cases, especially when A isn't asked as "B? and C? ", a "stub" answer may be a good idea: one that disentangles the issues & explains how the linked duplicates address them. In others there may be some mileage in a "compare & contrast"-type answer. If the new question is distinct enough that you need to combine two old questions to made it a pseudo-duplicate, then it's not a duplicate. Leave it open and, if you want, use the information from the other two posts to create an answer to the combined question. These changes are tracked in PostHistory to allow anyone to detect abuse, while the results update the PostLinks table so that existing logic continues to work (I mention this because some of you may wish to lean on SEDE for observing how this works out, once it gets updated). while the duplicate link is auto generated it is actually inserted into the question body so can be edited. It should always remain, but there's nothing to stop you (or anyone else) editing extra links into the list or indeed replacing the current one with a more appropriate one. How far would this question about dependence and correlation have to be edited to not be deemed a duplicate? Are questions such as “What are important topics in machine learning right now?” acceptable on this forum? Closing a terminology question as primarily opinion-based vs. writing an answer explaining why it is primarily opinion-based?